We visit the world renowned La Selva Research Station in the Caribbean lowlands, travel through the Eastern highlands, bird the forests around the Arenal Volcano & visit the cloudforests of Monteverde. Palo Verde in north-western Costa Rica is the next region to demand our attention before exploring the Tarcoles Estuary & Carara Biological Reserve of the central Pacific Coast. 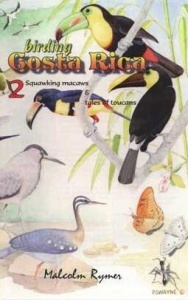 The first part of the travelogue 'Snowcaps, Sunbitterns & tails of quetzals' contains an introduction to Costa Rica's species-rich birdlife and then visits different regions discovering an amazing range of wildlife.